"A variety of medications, supplements, and surgical techniques are available for treating arthritis in dogs. Veterinarians try medications first, and then use surgery to improve the way joints are aligned or to eliminate any bone-on-bone contact. Veterinarians also recommend weight loss to take stress off of joints along with moderate amounts of exercise. Physical therapy after surgery can be beneficial. Techniques will work to maintain or increase joint motion. Arthritis pain relief can be addressed with medications, cold and heat therapy, and treatment options such as prescription anti-inflammatory drugs, nutraceuticals, dietary changes, exercise, weight loss and surgery. 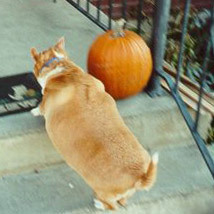 Diet will be addressed for dogs that are overweight, since weight creates joint stress. The addition of Omega 6 and 3 fatty acids as a supplement can help to reduce joint inflammation and the production of some prostaglandins. Patients are monitored for any change in condition and to adjust the dosage of recommended medications." Over-the-counter dog arthritis medication and supplement options include (left to right): Natural Remedies Muscle & Joint Support, foods fortified with omega 3 and 6 fatty acids such as Hills j/d formula, and dietary supplements such as Cosequin to help joint pain and mobility. 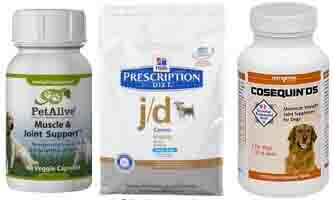 Arthritis prescription medicines for dogs are usually a class of medications called NSAIDs. These drugs can help to relieve arthritis-related discomfort and joint problems associated with canine osteoarthritis. The problem is that all NSAIDs can have gastrointestinal upset as a side effect. Because of this a veterinarian will only recommend the use of these medications when needed and in limited doses and for limited periods of time. This may be supplemented with safe dietary supplements such as glucosamine and chondroitin, and the fatty acid supplements Omega 3 and 6. Other treatments involve losing weight if overweight, creating an exercise plan (at home and with additional help such as physical therapy if needed), and in some cases surgery. Canine arthritis pain relief treatment often includes non-steroidal anti-inflammatory drugs (NSAIDS). Each dog arthritis medication can help to relieve inflammation while also relieving pain. Mild self-limiting side effects are common and may require monitoring via blood tests to check for liver and kidney problems. Since stomach problems are the number one side effect, other drugs might be prescribed to protect the stomach. Serious side effects are rare, but can include death. They can occur even when the product is used as prescribed. Rimadyl (carprofen): Relieves pain with few side effects. Dogs must be monitored for liver function (using blood tests). Be certain to be under the care of a Vet when using this drug. Rimadyl is a NSAID or non-steroidal anti-inflammatory. Liver problems are said to occur in 1-2% of dogs, particularly Labrador Retrievers. Etogesic: Also a NSAID, but with little medical history to make a judgment. Said to help reduce stomach side effects. Prednisone: This drug is a steroid. Corticosteroids and steroids can provide dramatic improvement, however they can cause other problems such as weight gain or muscle loss. For this reason these drugs are usually used as a last resort. Note: Human pain and arthritis medications or NSAIDs such as Advil can be lethal (deadly) for dogs. It can also trigger liver and kidney disease in addition to gastrointestinal problems. These drugs are effective at managing symptoms of arthritis, but they don't slow the progression of the disease. Certain medications can be toxic to dogs. Ibuprofen can be dangerous due the potential formation of ulcers. Acetaminophen could be problematic as well. Aspirin could be a good alternative as long as you don’t see any change in your dog such as loss of appetite within 24 hours. Vetrin Dog Arthritis Aspirin: This drug is aspirin for dogs. It does not cause the stomach issues found in humans. It generally considered to be safe and effective for chronic conditions such as canine arthritis and dog hip dysplasia. Also, depending on the size and breed of your dog, dosing will be different. If the arthritis medicine for your dog works, your dog should respond quickly. Again, only use NSAIDS, aspirin, or any other dog arthritis medication under the advice of a veterinarian as they can be toxic, particularly in small dogs. A variety of natural products including antioxidants, nutraceuticals and homeopathic remedies are helpful in the management of canine arthritis. SAMe is an antioxidant that is showing promise in recent research by the University of Illinois for helping to reduce join inflammation without the side effects associated with prescription medications such as NSAIDs. It is thought that SAMe participates in the making of genetic material, known as DNA, and cartilage. In clinical studies with humans this antioxidant has been shown to have a positive impact on arthritis. Canine clinical studies are now underway at the University of Illinois. This antioxidant is recommended for dogs that cannot take NSAIDs due to pre-existing liver or kidney problems, or for owners that want to avoid the side effects of prescription products. As with all medical choices consult with a veterinarian regarding this new dog arthritis option. Arthrospira platenis (Spirulina) for its ability to help bring nutrients throughout the body; a natural source of chlorophyll known for nutritive properties. Arthrospira platenis is widely used as a source of chlorophyll and for its nutritive properties; contains protein, vitamins (including B12 and folic acid) and carotenoids. (Romay, C., Armesto, J., Remirez, D., Gonzalez, R., Ledon, N., and Garcia, I. “Antioxidant and anti-inflammatory properties of C-phycocyanin from blue- green algae”. Inflamm.Res 1998;47(1):36-41). Lecithin for stronger cell membranes. Found in liver, eggs and wheat germ. Helps strengthen cell membranes and liver function. Glucosamine sulphate as mentioned above, glucosamine suphate is a crucial element in the support and maintenance of healthy cartilage, which provides cushioning at the end of the bones and between joints. Due to promising results in a number of clinical trials, this nutritional substance has been approved in more than 70 countries. It is also useful in easing normal age-related stiffness, and studies have demonstrated that this supplement is as effective in animals as it is in humans. A good and reasonably priced source for a supplement that combines all of these homeopathic ingredients is Muscle & Joint Support Formula, which is specifically formulated to treat symptoms, relieve pain and reduce stiffness of canine arthritis, rheumatism and degenerative joint disease in dogs. It also comes with a one year satisfaction guarantee. The nutracueticals Glucosamine and Chondroitin are supplements often used to help rebuild cartilage for arthritis dog pain relief. There is plenty of anecdotal evidence that they are effective in dogs with most evidence supporting glucosamine over chrondroitin. They are safe to use in combination with other arthritis treatments, so there is no downside to using them except the cost. Cosequin DS is the #1 veterinarian recommended glucosamine and chondroitin supplement. Glucosamine works by providing building blocks that help to form joint fluid and new cartilage. This improves joint lubrication and overall health. Chondroitin sulfate works by reducing degenerative enzymes that break down cartilage in a joint. Chondroitin also improves joint lubrication. Both glucosamine and chondroitin are used together. The goal is to improve the osteoarthritis condition enough so that the use of NSAIDS and their related side effects (such as stomach problems) can be reduced or even avoided. Glucosamine should not be used by dogs with diabetes, and chondroitin should not be used by dogs with bleeding disorders. Talk with your vet about whether or not he or she recommends these supplements for your dog. Note that these supplements will not relieve pain immediately; rather, they will help rebuild the cartilage, helping to solve the problem over time. Perna is found in New Zealand Mussels and contains glycosaminoglycans (GAGs). This substance lubricates the joints. It is a natural anti-inflamatory. As a joint treatment it may have limited effect since it is not easily absorbed when administered orally. Methylsulfonylmethane (MSM) is also an anti-inflammatory and slows the worsening of arthritis. It is better than many mainstream pain medications that contain aspirin due to it having fewer side effects. There is a significant amount of research being conducted on the value of anti-oxidants in both humans and dogs. These are found in Omega 3 and Omega 6 fatty acids, DHA, and Vitamin E. There appears to be a benefit to treating arthritis, and secondary benefits such as improved memory in older dogs. Recent discoveries in fatty acid nutrition have provided clear evidence that osteoarthritis in dogs (OA) may be very responsive to dietary additions of specific fatty acids. Studies indicate that nutritional management using a therapeutic food with high levels of omega-3 fatty acids, and in particular EPA, helped improve the clinical signs of OA in dogs as measured by pet owners, clinical orthopedic examination, and gait analysis of ground reaction forces. Therapeutic foods such as Canine Prescription Diet j/d, which is designed for companion animals with OA, supply age-appropriate nutrition and specific nutrients that may help reduce inflammation and pain, provide the building blocks for cartilage repair, slow the degradative process, compliment prescribed medications, and provide tangible improvement in symptoms of OA. A 75 lb (34.1 kg) 6-year-old female neutered Labrador retriever–mix dog was checked for lameness in the rear, two years duration, caused by degenerative joint disease (DJD) and hip dysplasia. The owner indicated that the dog had moderate to mild trouble getting up after resting, stiffness, limping, and reluctance to play, run or jump. The patient was placed on Prescription Diet Canine j/d and leashed walks were encouraged. NSAIDs were to be added if significant improvement was not seen in a couple of months. Improvements in clinical signs were seen by the owner within 45 days and the veterinarian noticed less pain when palpating the left hip joint after 90 days of nutritional management. The dog had not lost weight over this period of time and reaching optimal body weight and condition would be expected to further improve the clinical condition. No medications or supplements were necessary to control the clinical signs at this point and continued monitoring was recommended. The first step in helping a dog with osteoarthritis is weight reduction to normal levels. Most arthritis patients are overweight and could benefit from dietary management, This combined with exercise can in some dogs eliminate the signs of osteoarthritis. Arthrotomy: Removes anything that is aggravating the dog’s condition such as bone or tissue fragments. Arthroscopy: A tool that can be used to either diagnose a condition or remove an aggravating cause. It can also be used to flush the joint. Reconstructive Surgery: Techniques to improve joint stability or to correct any anatomical problem. For example reconstructive surgery is used for problems such as deformities and patella luxation (knee cap issues). Removal of Joints: Several procedures are used to remove joints such as a neck ostectomy or a femoral head ostectomy. Joint Replacement Surgery: Dogs can benefit from a total hip replacement. There are experimental procedures such as elbow replacement. Joint Fusion (also called arthrodesis): Joint fusion is used for chronic arthritic conditions and where the joint is unstable. The success of the outcome is based on the location of the surgery. Operations on the hock, stifle, elbows and shoulder have excellent outcomes.